Game-to-movie adaptations disappoint, and they should. How could something improve by taking away interactivity. agency? Game-to-movie-to-real adaptations are even worse. 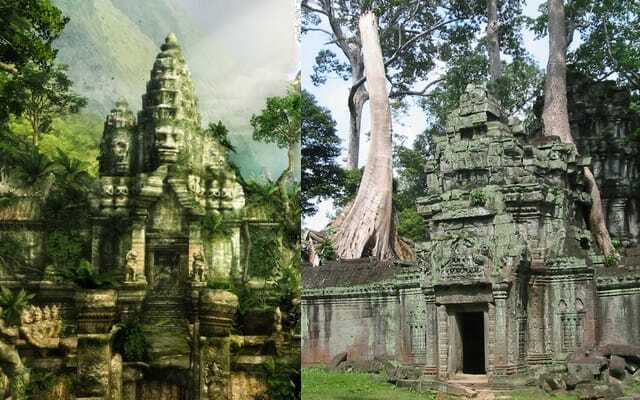 The temple at Ta Prohm, an overgrown Buddhist meditation station in Cambodia, served as the setting for a few scenes in the 2001 adventure flick Lara Croft: Tomb Raider. The film was, not surprisingly, breast-centric, doing little justice to the millennial legacy of the temple. 2008 saw the intellectual property return to the presumption of the Buddhist relic in Tomb Raider: Underworld, recapturing the mystery and puzzle of archaeology, and staying fairly breast-centric.